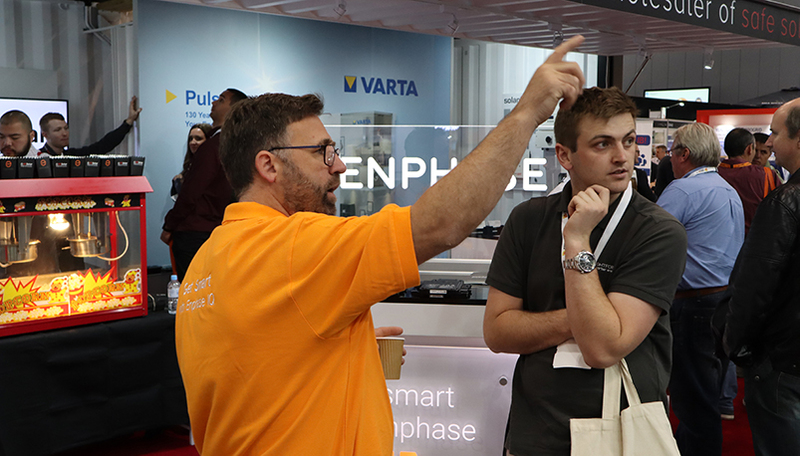 This year’s All-Energy 2018 Tradeshow was the biggest yet – not just for the industry but also for Enphase. We ran workshops that were standing room only, gave speeches not only on the advantages of our Micros but also how we believe Enphase will once again revolutionise the solar industry with our IQ 8 and Ensemble operating system in 2019, and supported our distribution partners on their booths. Enphase’s Vice President and Chief Commercial Officer, Dave Ranhoff, and Director of Product Line Management, Harsha Venkatesh, together with our Australia and New Zealand sales manager, Shekhar Prince, held countless meetings with our installation partners and their feedback was unanimous – Australian installers are some of Enphase’s more knowledgeable and enthusiastic global partners. So, it’s no surprise that this year’s All-Energy Enphase Drinks event marked a special occasion – the inaugural Enphase Awards. For the first time ever, we were honoured and excited to reward our top Enphase installers for all their hard work and commitment over the past 12 months. Positronic Solar is a Queensland based solar installation company with over 25 years of experience in both residential and commercial solutions. Positronic Solar’s experience shows in its incredible track record of flawless Enphase installations. Positronic has ensured a high standard of adherence to best practices for all its installations, a solid achievement given the number of installations it has already completed in 2018. Global Home Solutions covers New South Wales from both Sydney and Newcastle centres. With a whole home energy approach to reducing electricity bills, Global Home Solutions has recently included Enphase solar systems in its offerings. Thanks to word of mouth from delighted customers and a dedicated team, Global Home Solutions has done an incredible job with growing its volume of Enphase installations in New South Wales. Solaray Energy from Sydney has installed more Enphase systems than any other installer in Australia. Having installed several generations of products, Solaray Energy has been a solid Enphase partner for years and its activations map in Enphase Enlighten shows it with systems on rooftops everywhere. Solar Service Group has rolled out a huge amount of Enphase AC Battery installations since the product’s release. All Green Environmental installs Enphase systems across New South Wales, from the Central Coast to Newcastle, Hunter and Sydney. Across these regions, All Green’s team always give 110% to ensure the customer receives a great experience. Our own customer support team at Enphase recognises All Green Environmental for its patience and professionalism in resolving any technical issues for its customers. Helping Victorian homeowners shift towards greener and more sustainable home energy since 2007, G-store utilises online channels to service customers with a huge range of products. By cross-selling Enphase through these channels and in great home energy packages, G-store has done an outstanding job in marketing the Enphase brand alongside other great products. GoSolar Newcastle is a premier provider of Enphase solutions for homeowners and business owners in the Newcastle region. When speaking to our product end-users provide testimonials about the excellent job the GoSolar Newcastle team did on a customer’s Enphase installation. Thank you again to all of our Award Winners as well as to our Premium, Preferred and in fact all Enphase installers across Australia and New Zealand. We are excited about a great 2019!